The nice thing about an articulated doll is any imagined scene can come to life. 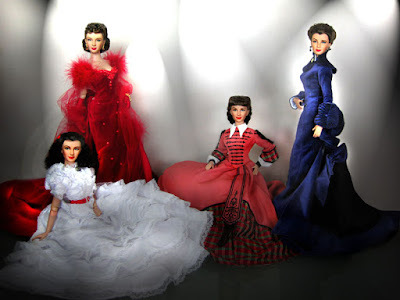 I've always loved Vanity Fair covers specially their Hollywood issues, so I thought of posing some of my Scarlett dolls ala Vanity Fair. Missing here: Kissing Ashley Goodbye doll and Trip to Saratoga. Heeee! I love the VF shoot! Isn't there an option on flikr or somewhere that you can put Vanity Fair on top and make it look like the real mag? I've seen them going around, but not sure how to do it.